The aim of The Da Vinci Game is to be the first player/team to solve challenges and win one of each of the four pieces of Treasure from the four Treasure Spaces, then return to the Ankh space to solve one final challenge and become the Grand Master of The Da Vinci Game. 1. Decide whether to play in teams or as individuals. If playing as teams, divide the players into twos or threes. Note: For the purposes of simplicity, throughout these rules “team” shall mean either individual player or team of players. Teams should place one playing piece on the Ankh space and keep their spare piece close at hand. 4. Decide who is to start. Play then proceeds in a clockwise direction. Each team must collect Category Tokens which will permit it to attempt challenges at each of the four black Treasure spaces on the outer track of the game board and, if these are correctly solved, win the corresponding piece of Treasure. When all four pieces of Treasure have been collected the team must return to the Ankh space and solve one final challenge to win the game. Each team, on its turn, throws the die and if a 1, 2, 3, 4 or 6 is thrown, moves its playing piece the indicated number of spaces along the tracks on the game board. If a 5 is thrown the team can move any number of spaces up to a maximum of 5. A team can move in any direction, but cannot retrace its steps within a turn, nor may it change direction at any of the intersections in the middle of the board within a turn. However, a team which ends its move on one of these intersections may move off it in any direction on its next turn. Spaces can be occupied by more than one team. The space a team ends its move upon dictates what further action it should take before play passes clockwise to the next team. Ankh - Teams begin from this space and must return to it to attempt to win the game. If a team lands on the Ankh space at any other point during play, no action is taken and its turn ends. ii) Take one Category Token at random from the cloth bag, whereupon its turn ends. 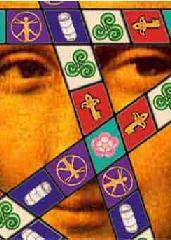 Codex - A cryptic rhyming couplet, the answer to which is a common word, such as an item or an object. Logic Key - A statement, question or riddle, the answer to which is a number. Rose - A cryptic rhyming couplet, the answer to which will be a country, place, mountain, lake, river, building, landmark, etc, etc. 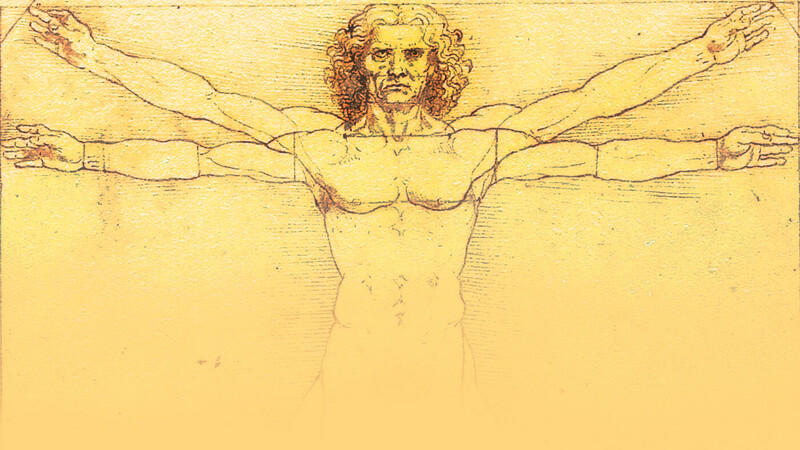 Vitruvian Man - An anagram of a movie, song, book, play, work of art, or a famous person from the world of movies, literature,music or the arts. When a team lands on a Clue space it initiates a challenge, not for itself, but for all of the other teams. The initiating team takes a Clue Card of the relevant category (ensuring it is not seen by the other teams), reads aloud the challenge and then immediately starts the timer. The challenge should then be read aloud again. Teams may request further readings or clarification as often as they require. Vitruvian Man cards work slightly differently in that the anagram alone should be read aloud (ensuring any necessary spellings are provided), and teams given time to write it down, before the timer is started. Immediately the timer has been started the accompanying hint and composition of letters in the solution should be read aloud. Once the timer has been started, teams race against each other to solve the challenge within the 60 seconds allowed. As soon as a team solves a challenge it writes the answer down and places its spare playing piece on the highest-ranked available numbered bid space on the game board (1 for the first team, then 2 and so on). Once a team has bid it may not touch its pencil and paper again until the challenge has been completed. 3rd, 4th and 5th correct bids - 1 token. Note : A team may never retain more than four Category Tokens. If a team gains more than four, it must choose which excess tokens to return to the cloth bag. Treasure Spaces - There are only four of these spaces - one each for Codex, Logic Key, Rose and Vitruvian Man. When a team lands on one of these spaces, it may initiate the appropriate challenge exclusively for itself. If the team wishes to attempt a challenge it must be in possession of two of the corresponding Category Tile. These must be discarded back into the cloth bag. 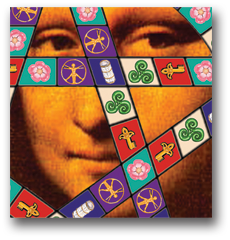 A Mona Lisa tile is wild and can be used to represent any of the four treasures (like a Joker in many card games). If the team does not have the corresponding Category Tiles, its turn simply ends. One of the other teams then takes a Clue Card of the relevant category and proceeds as previously described, but with only the initiating team attempting to solve the challenge. 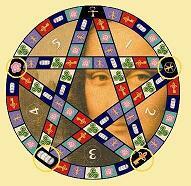 If the playing team solves the challenge correctly, it can take a piece of Treasure of the associated type. Only one piece of each Treasure may be held by a team. Treasure pieces are differentiated from Category Tokens by having a black background. If the team is unable to solve the challenge correctly it must move off the Treasure space on its next turn and return on a subsequent turn to try again with a new challenge. 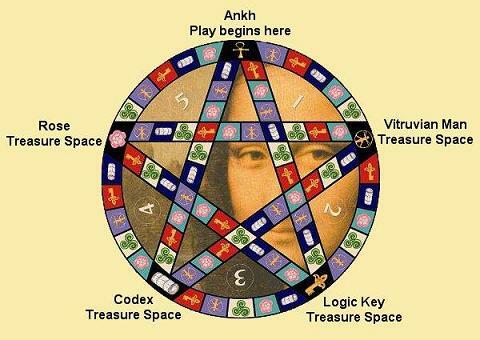 Once a team has collected all four pieces of Treasure it must also collect one of each Category Token (not including the Mona Lisa token which has no value at this stage of the game) and return to the Ankh space. An exact throw is not required to reach the Ankh space for the final challenge. Once on the Ankh space the team reveals its four different Category Tokens and throws the die again. The value thrown will then dictate which challenge is to be attempted as detailed below. If the team correctly solves the challenge within the time limit it becomes the Grand Master and wins the game. If the team fails to solve the challenge, it must return one Category Token of its choice to the cloth bag, leave the Ankh space on its next turn and return on a subsequent turn, once the discarded Category Token has been replaced, to attempt another final challenge. Please click for a printable version of the rules, sample clues, the contents of the game, to read about the codes and symbolism within it, find out where to Buy Board Game, or for other information, click here.